I feel my insides come through my throat as I come to a sudden existential stop. Light bends around my collecting room, giving the sensation that reality is pregnant. For not the first time, I tense every muscle in my body and wait for the physical impossibilities to subside. The light returns to the pathways set forth by the laws of this universe, bouncing off the dust in the air through the ground level window just above my height. My basement. My house. I have returned! And not alone: I pull from my coat pocket a small wooden box and set it on the table. Inside is a small creature, no bigger than a large flying insect. Aquamarine wings protect the creature’s body and shimmer in the paltry sunlight shining in from the basement window. I coax the wings open with a wooden dowel. They flutter, reflecting the sun, revealing the body. 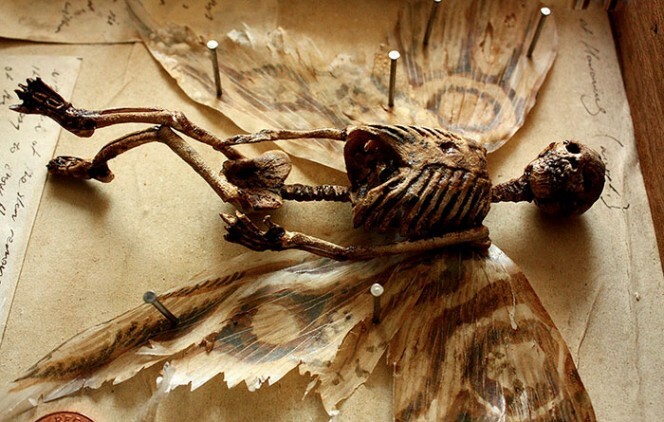 The creature is not an insect, but a miniature human, attached to wings, sleeping. The creature blinks the sleep out of its eyes and looks around, realizing it is coming to in a strange place. The creature begins to cough. “What’s wrong with me?” it gasps between spasms. “You are dying,” I reply. I see the creature begin to panic. The fear enters its eyes and I know it is deciding whether to fight or flee. “There is nothing you can do,” I offer to ease its mind, “Death is unavoidable now.” I leave the table for a nearby mop bucket and begin to clean up my insides that landed on the floor. The creature seems to take this in and consider its situation. I look at the creature, in the eyes so that it will no that I am no lying. “You are dying because you are cut off from the source of magic. Surely you must sense that.” Realization dawns on the creature’s eyes. It knows that I am right. It does not have long. But it doesn’t know what to do with this information. I take a small, round, metallic device out of my pocket and show the creature. “I brought you to this world through a rip in my universe. I control the rip,” I finger the black button on the device, “You can only go home if I want you to.” The creature has a moment, a sliver of hope shining through its eyes. “But I do not want you to.” I put the device back in my pocket. The creature fights back tears, fights back anger, knowing that it will do no good. It flutters its wings, testing its ability to fly without magic. I note that its skin grows more sallow by the minute. Death is not far off. The creature manages lift. I guess magic is not necessary for flight. Interesting. I’ll have to make a note in my journal. I return to the task at hand, my sick. The creature’s wings produce a pleasant buzzing tone, then grows sharper. I feel a fiery pain on the back of my head, then I see the absence of light as I slump to the floor. The first light I see is stars, pinpoints of light in the black. Then the dusty, wooden light of my collecting room resolves in my eyes. The creature is pulling a small metallic device from my pocket. I reach for the creature, but it’s too fast and buzzes out of my grasp. It then hovers just out of my reach, dangling the metallic device above me, taunting. I attempt to stand, but my leg cannot comply, and I trip face first onto the hard ground. The world spins and my head explodes. The stars return to me. As it subsides, I glance to my leg. The clever little creature has tied me to my table. “Looks like you won’t be able to stop me,” the creature coughs. The creature seems to be decomposing in front of my face. Its stomach has sunk in so far that it almost seems skeletal. I reach into my pocket and pull out a knife to cut the rope the creature used. “That’s my cue to leave,” it says. I calmly begin to saw through the braids. The creature sets the device on the table, no longer able to hold it up. I continue my sawing. The braids are thick and this will take some time with my little pocket knife. The creature walks over to the side of the table and gives me a little wave while staring daggers. I return the daggers but continue sawing instead of waving. It returns to the device and presses down with all its might on the little black button. The black button activates the device, throwing a barely visible light against the wall. Flashlights do not work well in sunlight. The creature comes off the button and the light disappears. I smile. When I am free, I set to my work, pinning the creature in its display case. Decomposition works fast on these creatures when they are removed from their magic. This creature will make a fine addition. By the time I am done, the creature’s skeleton appears bleached it is so white. Yes. A fine addition, indeed. The following image inspired this story, as well as the article that it came from. This Tiny Skeleton Was Found Under A London Orphanage, But Look Closely And You'll Scream. Still trying to figure myself out after all these years.